Benefit of infirmities in the investigation by the prosecution is to be given to the accused, the Supreme Court said, in State of Uttarakhand vs Jairnail Singh, while upholding a high court verdict reversing conviction awarded by the trial court. The Supreme Court, in Uttarakhand Transport Corporation vs Sukhveer Singh, while upholding dismissal of a bus driver from service of Uttarakhand Transport Corporation, observed that acts of corruption/misappropriation cannot be condoned, even in cases where the amount involved is meagre. The Supreme Court, on Monday, suggested amendment of the Insolvency and Bankruptcy (Application to Adjudicating Authority) Rules, 2016, permitting settlement to be recorded by the Tribunal after admission of case under the Insolvency and Bankruptcy Code, 2016 (IBC). Interpreting Section 14 of the Maharashtra Village Panchayats Act, which disqualifies an encroacher from being a member of panchayat, the Supreme Court, in Sagar Pandurang Dhundare vs Keshav Aaba Patil and others, observed that only the original encroacher, who has encroached upon the government land or public property, is liable to be disqualified, and not his family member. The Supreme Court on Tuesday held that the allegations made by Kamini Jaiswal and Prashant Bhushan against Chief Justice Dipak Misra was “derogatory and contemptuous” but desisted from initiating contempt proceedings “in the hope that goodwill will prevail”. The Supreme Court bench of Chief Justice Dipak Misra and Justices D. Y. Chandrachud and A. M. Khanwilkar on Thursday dismissed a writ petition seeking an injunction against the release of the film ‘ An Insignificant Man ’, documenting the life of Delhi Chief Minister Arvind Kejriwal. In a setback to the Rajasthan Government, the Supreme Court, on Wednesday, restrained it from exceeding the 50% ceiling in providing reservations to Gujjars and other communities under the OBC category. A Supreme Court bench of Chief Justice Dipak Misra, Justice R Banumathi and Justice Ashok Bhushan on Monday admitted the review petition against judgment dated May 5 of the court upholding the death sentence awarded by the Delhi High Court in the 2012 Nirbhaya gangrape case. The Supreme Court on Monday expressed displeasure at the failure of Jaiprakash Associates Ltd. (JAL), a unit of real estate giant Jaypee group, in failing to comply with its order dated October 25 to deposit Rs 2,000 crores with the court’s registry by November 5. The Supreme Court, on Monday, directed the Madras High Court to pronounce its judgment as expeditiously as possible in the Appeal filed by a Ukrainian national, Mr. Dudnyk Valentyn, who has been convicted under the Arms Act. The Supreme Court bench of Justice Madan B Lokur and Justice Dipak Gupta on Friday urged all state governments and Union Territories to issue similar directions prohibiting the use of pet-coke and furnace oil by any industry, operation or process within their jurisdiction as issued by the Union Ministry of Environment, Forests and Climate Change (MoEF & CC) and the Central Pollution Control Board (CPCB) under Section 5 of the Environment Protection Act of 1986 with regard to the states of Rajasthan, Haryana and Uttar Pradesh. The Supreme Court on Monday issued notice to the Centre on a petition seeking weeding out of harmful chemicals and pesticides being used in India causing severe health hazards to farm workers, people living in the vicinity and the consumers. The Supreme Court on Wednesday rapped Uttar Pradesh government for failing to file a comprehensive policy on the issue of pollution in the Taj Trapezium Zone (TTZ) and nearby areas as directed under its order dated October 17. While hearing the writ plea of some under-trial prisoners who have been in custody for over nine years, the Supreme Court directed the district and sessions judge concerned to ascertain reasons why 179 hearings took place in the matter without any substantive progress, and to send a report to this court. A Supreme Court bench, led by Chief Justice of India Dipak Misra, has issued notices to the Centre and wildlife bodies like Wildlife Institute of India, National Board for Wildlife, National Tiger Conservation Authority, on a PIL seeking a direction to relocate human settlements from reserve forests to save the tiger population in the country. A two Judge bench of the Supreme Court referred the petitions challenging the selection process of Kerala Higher Judicial Service (District & Sessions Judges) to the Larger Bench. 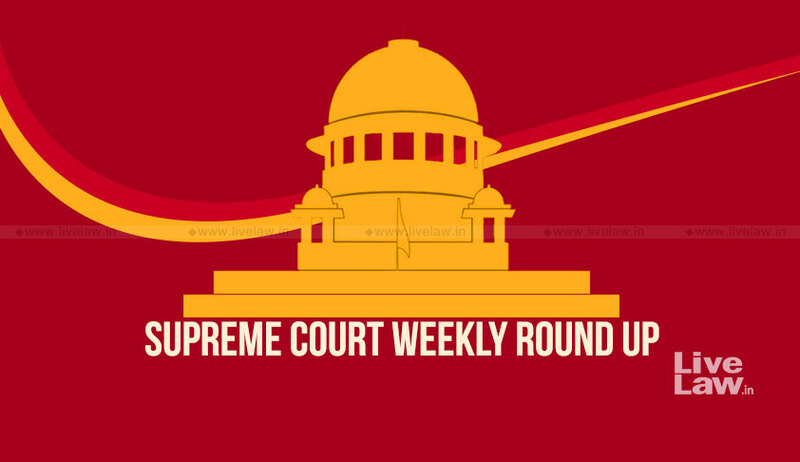 The Supreme Court, on Wednesday, referred to a Constitution Bench the question of reconsideration of its 2006 judgment in the case of M. Nagaraj v. Union of India. The Bench comprising Chief Justice of India Dipak Misra, Justice A.K. Sikri and Justice A.M. Khanwilkar passed the order, in view of a challenge to the interpretation of Articles 16(4), 16(4A) and 16(4B) of the Constitution of India. Supreme Court sought the response of the Centre on a petition seeking regulation of the flow of Bitcoin (Crypto Currency) and wanted that the virtual currency be made accountable to the exchequer. The purchase of AgustaWestland VIP choppers by the Chattisgarh government, a multi-million dollar deal, a decade ago came under the scanner of the Supreme Court on thursday. A bench of justices Adarsh Kumar Goel and U U Lalit asked the state government to furnish within one weeks time the original documents of the procurement of the helicopters. The Supreme Court bench of Chief Justice Dipak Misra, Justice DY Chandrachud and Justice AM Khanwilkar on Thursday directed the Central Bureau of Investigation (CBI) to submit by Monday its affidavit in response to Karti Chidambaram’s application seeking permission to travel abroad. Citing the National Investigation Agency(NIA) Act 2008, the Supreme Court on Friday asked the central government why the “already much-delayed” rules cannot be framed for witness protection in the country on the very same lines as included in the NIA Act.